Nova Roma. Piqued by his poor reception in largely pagan Rome, Constantine the Great moved the court to Byzantium, which he renamed Nova Roma, New Rome. And it was to be a Christian town. Soon, the city came to be called Constantinople, the City of Constantine, and the imperial residence morphed into the new imperial capital. The Queen of Cities. In the Middle Ages there was no more splendid a city in Christian Europe than Constantinople. And it could hold its own against most Moslem cities, as well. Western European visitors were astounded by its wealth, myriad churches, thriving port, great collections of ancient art, imperial court ceremonial, and the goods bartered and sold from all corners of the earth. Istanbul from the Ashes of Constantinople. The glory of the Queen of Cities came to an abrupt end in 1204 with the Fourth Crusade. But Constantinople limped along for another two and a half centuries. By the time of the Turkish conquest in 1453, the city was more ruins than city. But for the next four hundred years the Ottoman Turks lavished incalculable wealth and manpower into making Istanbul a world class city once again. If ever there were a city that deserved the title “Imperial” it was Byzantium: as Nova Roma she was capital of the late Roman Empire, as Constantinople capital of the Byzantine and Crusader Empires, and as Istanbul capital of the Ottoman Turkish Sultanate. For nearly a millennium Byzantium was a prosperous but not especially important port on a peninsula that controlled the waters between Europe and Asia. But then Constantine, in the fourth century AD, became enthralled with its strategic possibilities. The city would never be the same again; it was catapulted into the ranks of history’s great imperial megalopolises. In this course we will study the great monuments, sites, and structures of the Roman, Byzantine, and Ottoman eras: the ruins, churches, mosaics, statues, mosques, and bazaars of the premier Imperial City. The lectures are richly illustrated with images, and course materials include detailed lecture notes and an extensive syllabus including maps and ground plans. 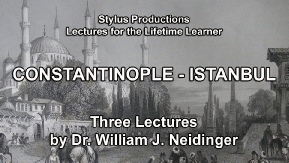 New special pricing for the entire CONSTANTINOPLE - ISTANBUL series.